Wow--sorry I'm so behind getting this posted...we traveled to Indiana for vacation right after convention and then there was a sudden death in my family so I haven't been on the computer much. 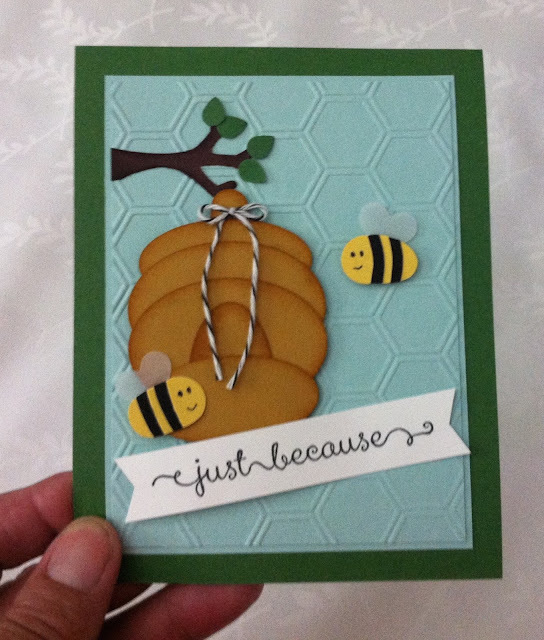 My base is garden green with 2 layers of pool party--the top one embossed with the honeycomb embossing folder. The tree branch and leaves are from the new tree builder punch and I made the hive using the wide oval and large oval punches. The hanger part on top is the word window punch. I think I used hello honey for this. My bees were the trickiest part. I started with the 1/2" circle punch and cut it down. Then I punched the rest and cut them with the same angle using the first as my "pattern." Then I glued them together and added the details with my basic black marker. The wings are from the small heart punch in cardstock vellum. My sentiment is from the set: A Dozen Thoughts. My inspiration for this card came from a card I saw on pinterest by Heather Klump. 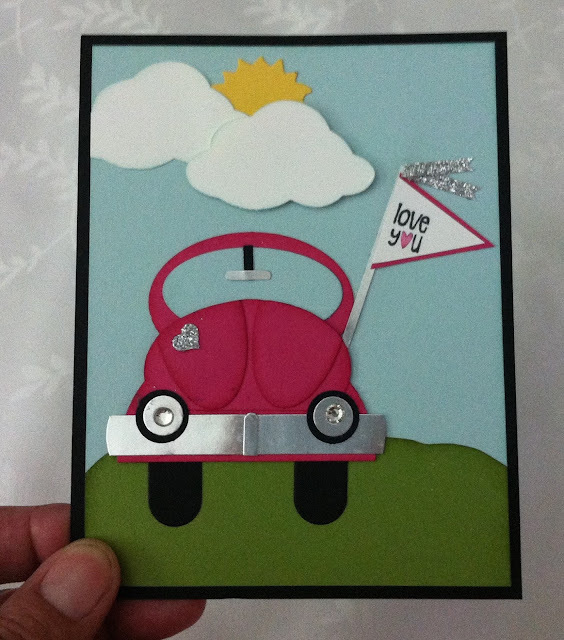 My second card is a Volkswagen Beetle....sort of....I just couldn't get the side mirrors on without it looking very strange! The card base is basic black and the grass (I just handcut it) is in old olive. This is mounted on soft sky. The clouds are from the tree builder punch and the sun is one of the Flower Fair framelits. The bug is made using the wide oval and small oval punch. I can give specific details if anyone wants them (just let me know). The bumper was done with 2 of the word window punches with the ends trimmed a bit more bluntly. I hand cut the curves on the skinny bumper piece and rearview mirror. The heart on the car is from the confetti hearts border punch. My tires were done with the Handpicked framelits (the one that looks like a pencil). To make my pennant I punch a 1" square, marked the center on one side and then hand cut to the corners to make the triangle. I then just glued them on some melon mambo paper and cut them out. The sentiment is from the set Banner Banter. I have a funeral tomorrow so I doubt if I'll post Day 3 then--probably be Wednesday.